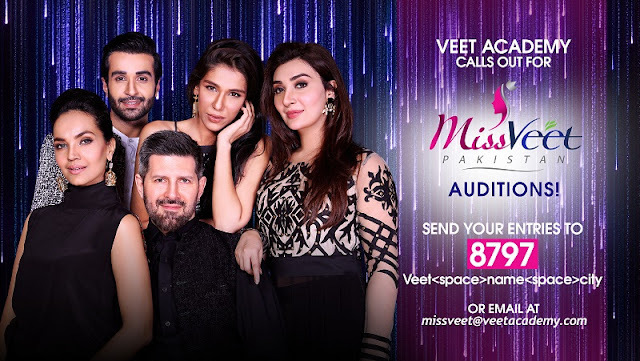 Veet, the number one depilatory brand in the world, is all set to hold auditions for its new reality show, Miss Veet Pakistan. The auditions will take place in Karachi, Lahore and Islamabad on 10th, 15th and 17th of August respectively. Hundreds of registrations have been received already. Led by a panel of country’s well-known celebrity judges, Aisha Khan, Aminah Sheikh, Tapu Javeri and mentored by supermodel Fayezah Ansari; contestants from all over the country will get a chance to go through a transformative journey that redefines beauty through Veet Academy. Veet Academy is a platform that aims to give every Pakistani girl the opportunity to get trained by the country’s top celebrities and trainers; and transform themselves to the very best that they can be. It will be these very girls who will be competing for the title of Miss Veet Pakistan. “Miss Veet Pakistan is a journey of transformation of an ordinary girl to an overall star.” said Maha Changez, Brand Manager, Veet. Veet believes that women can rise above the ordinary, and Miss Veet Pakistan aims to show that with the right training, girls can be beautifully confident in their own skin. Veet is the leading name in depilatory products with over 80 years’ experience of developing safe, effective hair removal products that are successfully used by over 30 million women across the world, every year. Reckitt Benckiser sells more than 46 million Veet products every year worldwide.